With so many of us working for ourselves and juggling child care, I think we have perfected the art of carrying our office in a bag. Could you have imagined just 15 years ago that we could sit by the side of the swimming pool and still do our work while our child swims? Or sit outside the school typing up a report that is due in later that day or loading up your social media for the next three days while you lie in bed, actually strike that last one that is not good sleep health, load up social media while walking back from the school run. We are quite lucky that technology has created a flexibility for us to be able to be around for the children as much as we can and still meet our deadlines. Even as I type this blog I am sitting at a school the other side of town while one son attends a master class. By the time I drop him off and drive home it would be time to come back to pick him up so instead, last night, I packed my office bag and I am sitting in a room in a school I have never been to and writing this blog. 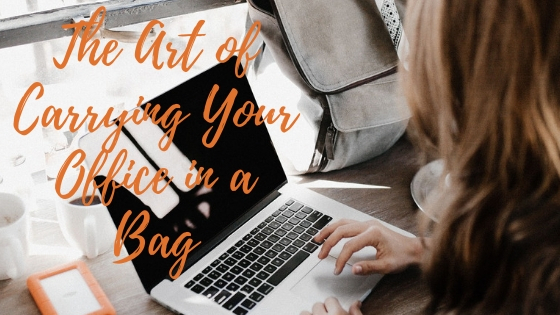 What do you need to create your Office in a Bag? Bag – I have a couple of bags which I love. One is from Knomo which I have had for over 6 years is a gorgeous red and still looks and feels new despite it being knocked around so much. You can see their current range by clicking here. Another bag I have is from Mia Tui, their Sydney backpack in a blue. It is comfortable to lug on your back and is one that I usually pack if I am commuting or going on holiday and need to take work with me. You can see their range by clicking here. Laptop – this is a personal choice and budget and work dictated on. Some swear by their Macs others say they swear at their Macs. Whatever you choose, remember you are going to need to be comfortable to type on and the right size to carry around. I would suggest looking at battery time but we all know you will end up getting a spare battery sooner or later! Notebook– I’m an old fashioned girl and find the act of writing notes in a notebook therapeutic, it not only helps me stay organised but also clears my mind unlike typing a list on a phone or keyboard. I love the Leuchtturm notebooks with a pen loop attached. I’ve recently discovered a new online shop for such notebooks and other journal accessories called Doodly. Diary- Personal choice, among our favourites is Filofax and Boxclever Press diaries. Phone – Whatever you want prefer but always make sure you get more memory that you believe you will need as it is never enough. There are so many great apps out there and it is a case of trial and error to see what works best for you from Pocket, Evernote, Trello, Toggl, Toodledo, Asana. Lets not get going with the creative apps as we will be here all day. Pencil Case – with at least two or three pens in different colours and concealor and a makeup correcting pen. Travel Mug – I have so many, one that can’t be knocked over, clear one, one that can be plugged in the car to heat up. Yes I am the mug queen, take that anyway you like! Snack bar of choice – naked’s lemon drizzle here! Emergency kit I got one at Christmas which is a small zip up pouch with needle and thread, wipes, deodrant wipes, buttons, safety pins, plaster, etc. It’s from Pinch and is their Minimergency Kit. Wallet – for receipts so they don’t end up crumbled in the bottom of your bag. Entertainment – A random toy for your child, and don’t forget you can always give them a spare sheet from your notebook and one of your coloured pens to keep them quiet for all of 30 seconds. Paracetamol –Because we have busy lives and sometimes the head lets us know its time to chill. What is in your office bag? Do you have an app or suggestion that we can add to our kit that you find invaluable, we would love to hear?